Hello my name is Martin Prestegaard I work as a 3D lead for Betadwarf Entertainment, a small games studio based in Copenhagen Denmark. As we’re ramping up for our new kickstarter campaign I’d like to share some of our art style. Betadwarf started out as a very low-budget start up several years ago at Aalborg University in Copenhagen. You can check out our story in simple images right here. It has been quite the ride as you can see, and after releasing our first game to some pretty decent success, we have been developing Forced: Eternal Arenas for the last couple of years. We’re almost there, but we need some help to go the last mile! Our game is a roguelike deckbuilding action game. Yes, that is quite the mouthful, but our Kickstarter video explains it more in depth! 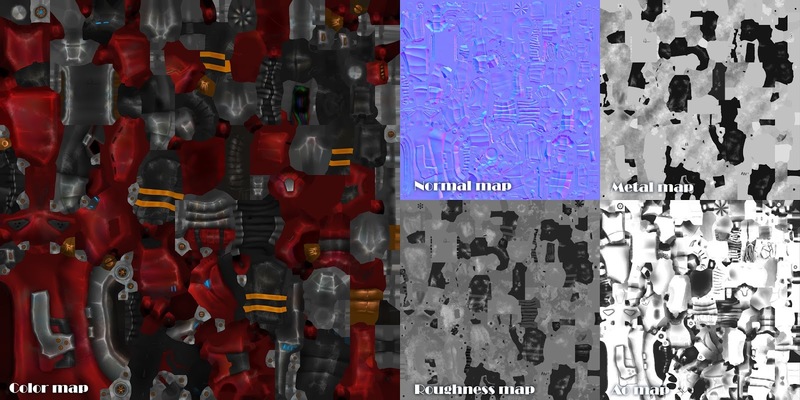 We attempt to have big chunky objects with lots of clean surfaces that, rather than small details, contain color or value gradients in the textures. 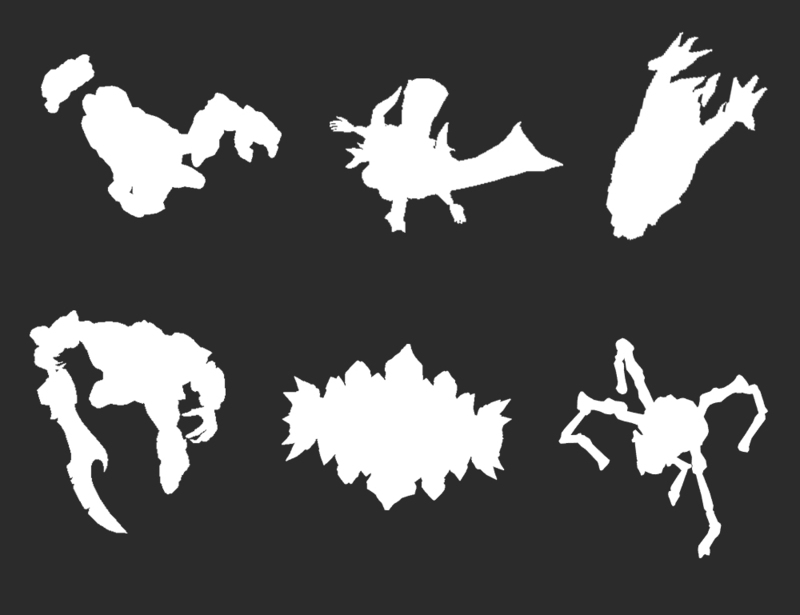 Each character must have a unique silhouette that separates him from his surrounding enemies. The shading must never outshine the color textures, so our game maintains the hand-painted feel at all times. First, here are a few of the characters we have made for the game. Throughout this article i’ll primarily use the Settsu Character to show how we create a new model. But most of the things I talk about are quite general and can be used on any character you want to make. 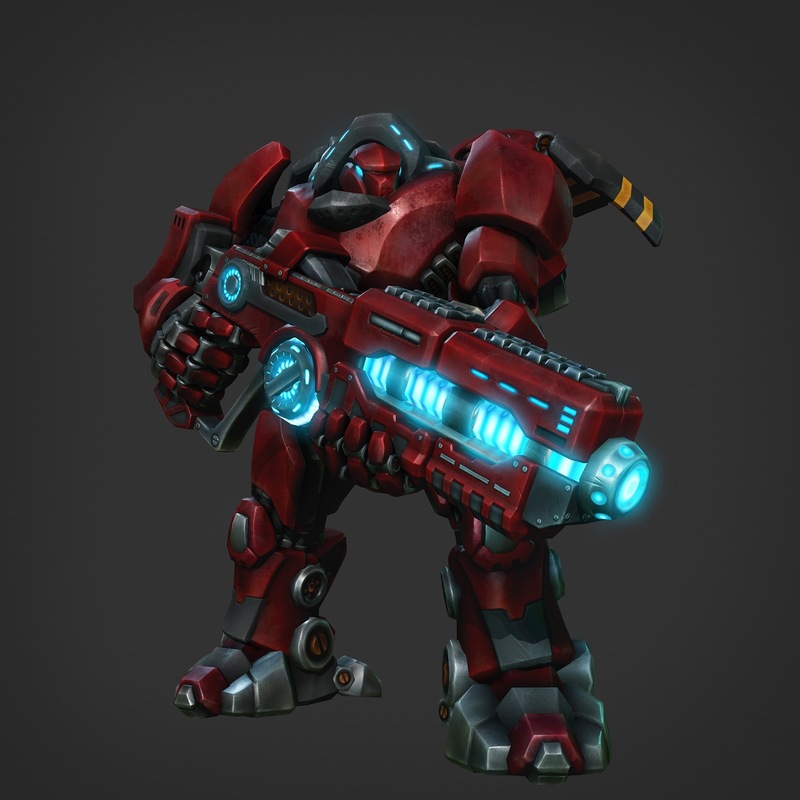 Normally every character model we make at Betadwarf will be done from start to finish by the same artist. We try to give the artist working on an asset as much creative control as possible and rely on loads of feedback and discussion along the way instead of creating the character from an already finished concept. Before I begin any character I always talk with the designers about what the character is supposed to do in the game, and try to figure out if there are any cool ways I can incorporate it into the model. This is sometimes a two way street and the gameplay of a character may change when you are bouncing ideas off the designers who might get inspired by a new take on things. Normally when a model visually matches the feel of its game design, it turns out far better in the end and will behave much more believably in the universe. Another important thing we always keep in mind when creating characters are their silhouettes. This is probably the most important step in the character development process: If your silhouette is off, your character will never really work no matter how much effort you put into the sculpt or textures. It is also the first thing people use to recognise an enemy so it is important that each character stands apart from one another if they can spawn in the same area. Notice that they are in their animated poses. It is very crucial to keep in mind how they will look when posed by the animator. You should always keep the angle of the camera in mind (in our case top view) when creating the first blockout. For us, It is no good to create a character that looks awesome from the front but has no unique shape from a top down perspective. I had a general idea that I wanted to create a heavily armored robot/suit that was capable of flight. I wanted it to stick to our art principles so it had to be super heavy and chunky with lots of its weight centered in its legs/feet. I also wanted to incorporate animation into the armor, maybe having it open up to reveal a hidden ammo stash. In the case of Setsu it was also going to be the first sci-fi asset we made and it needed to set the tone for all upcoming sci-fi stuff. With those few principles I started concepting. I normally start off with a standard human mesh in Zbrush and start adding shapes with the clay tubes and move brush trying to find some interesting silhouettes or shapes. I try to build up most of the model and find a silhouette before I do any real detailing or even definition. Looking at reference images can be massive help at this stage. The reason I do the concept in 3d and not in 2d, is because I am more comfortable in that work environment and I find it easier to explore different shapes and silhouettes inside Zbrush. It also allows me to quickly view my concept from all angles to see how it holds up from different point of views. There is also a speed bonus to it because, when I have a concept I like, the path to turning it into a sculpt is much quicker compared to having to start from fresh with a 2d concept. I am always careful not to start detailing or even defining any one part of my model before I know the general look/silhouette of a character. A good way to ensure that you do not get carried away is simply to stay on a poly amount that does not allow you to do any details. It is easier to concept and do big changes in lower poly amounts anyway, so stay there until you feel you have a good idea of how the character will look. Then go up in poly count a notch and start defining all of your model. If you work at the same poly density on all of your model at the same time you ensure the same style/detail level goes into all of it. Below you’ll see a few images to show how the character took shape from concept to final sculpt. Somewhere along the way the character transcends from concept to sculpt. There is no specific time this happens. For me it comes naturally after talking about/discussing the model with my fellow artist, and at some point I lock into a look I like. The silhouette came together quite quickly with the jetpack flaps being very defining from a top view camera. As I am getting further ahead in my sculpting process I start to think about the next phases: How will the model be textured/baked and how is the low poly going to work. You need to think about which parts will be one mesh and which parts you are going to keep separate in the low poly. 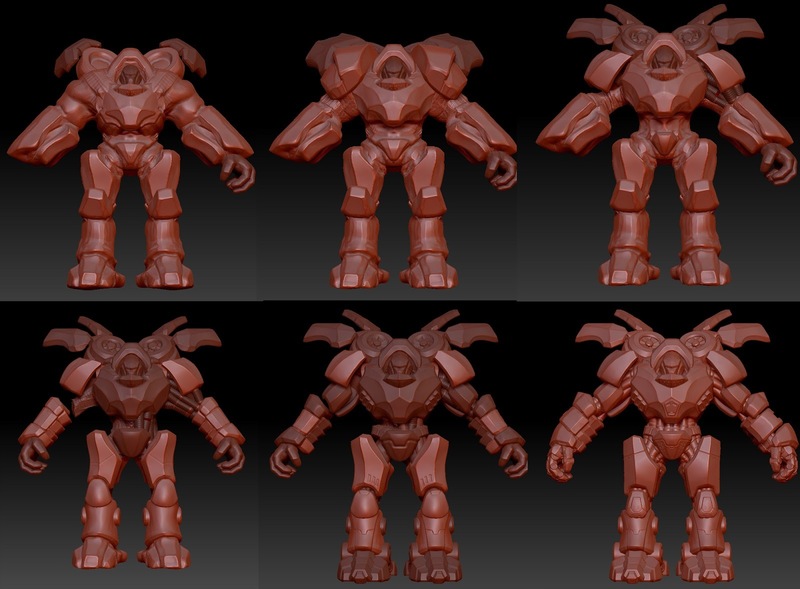 It is also in the sculpting phase you are in control of what the end polycount for your character will be. 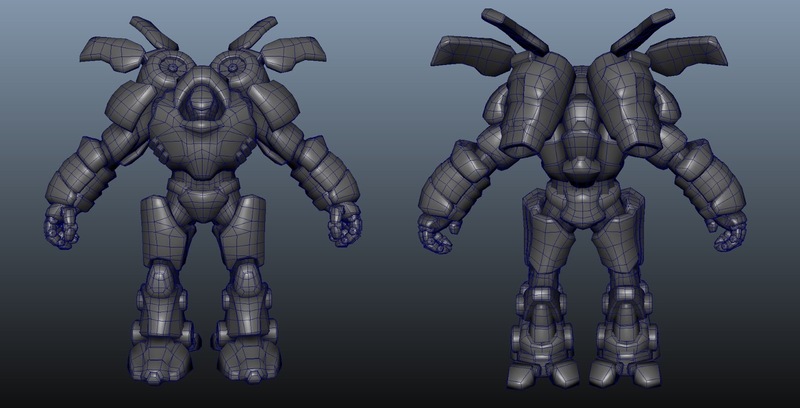 The more complex shapes you add the higher the poly count will be in the end. At this stage every choice you make will define how your normal bake/uv will need to be made. I’ll go over some simple rules that help me get a much better normal map bake without annoying errors or seams on the low poly. Any edge that is 90 degrees or sharper needs to be set to a hard edge/normals. Everything else should be soft normals. If you have made a hard normals edge make sure you cut it out in the uv so that the uv edge is not connected to another uv. Preferably it should be its own uv island. 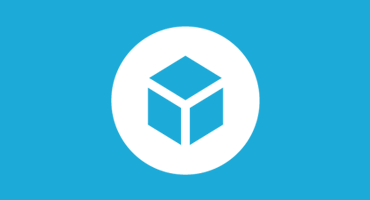 Make sure you have no reversed normals or -1 scaled mesh. Regardless of what program you use to make your low poly it is important you keep the above normal map rules in mind as you do it. We have no specific poly limits set on our characters at Betadwarf. We use the old phrase “use as many as you need and no more”:) How you find out what you need is simple, zoom away from your low poly from time to time and look at it from an ingame perspektive. If it feels jagged along the edges you need more polygons. If you haven’t already I would suggest you try out one of the programs that will allow you to draw directly on the low poly. It could be The Foundry’s Mari or Substance Painter. Either way; being able to paint directly on the asset just cuts so much time from your workflow. I have already talked about our principles for texturing and Settsu was no exception. I tried to keep the texture quite clean, because the model was already a bit overly detailed with all the different armor pieces. When it comes to weathering I always try and put scratches or worn areas where they make sense. For example the jet pack flaps are the highest part of the model so, it makes sense that it would scrape against things as the character moves around inside. I hope this gives you an idea of how our pipeline works, and that you found it interesting. I had a very hard time cutting it down to something that wasn’t an insane wall of text, but I hope it was still helpful. If you have any questions feel free to ask! Thanks a lot for reading, and remember to support our Kickstarter here. Thanks Martin, and good luck with the Kickstarter!